Newt Gingrich has always been a scary dude. Narcissistic, divisive, out of touch with democratic republican principles, and he is one power-hungry dude. Read his latest and be fearful of this lunatic ever sitting in a position of power again in America. (THE HILL)- GOP presidential frontrunner Newt Gingrich said Congress has the power to dispatch the Capitol Police or U.S. Marshals to apprehend a federal judge who renders a decision lawmakers broadly oppose. 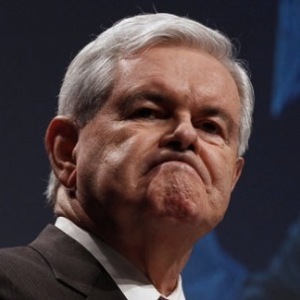 When asked if Congress could enforce the subpoena by sending the Capitol Police to arrest a judge, Gingrich assented. Gingrich made his remarks during a Sunday appearance on CBS’s “Face the Nation” where he defended his position that the president has the power to eliminate federal courts to disempower judges who hand down decisions out of step with the rest of the nation. Gingrich cited the 9th Circuit’s decision that reciting the Pledge of Allegiance in public schools is unconstitutional as an example of a decision drastically out of step with the values of the country. Gingrich noted the Federalist Papers describe the judiciary as the weakest of the three branches of the federal government and that Thomas Jefferson abolished 18 of 35 newly created judgeships. “I got in this originally for two things: the steady encroachment of secularism through the courts to redefine America as a non-religious country and the encroachment of the courts on the president’s commander-in-chief powers, which is enormously dangerous,” Gingrich said. Indeed a vote for the Newtie is a vote for fascism. For anyone who doesn't recall we defeated fascism in 1945 when when Italy's fascist regime and Nazis Germany fell to the Allies. Need any more be said?